a friend brought in the Kiss "Destroyer" album for record day. next four were The Beatles. Eric spent hours playing broom guitar to these albums. of Iron Maiden. Eventually over the years Eric became more interested in song writing. 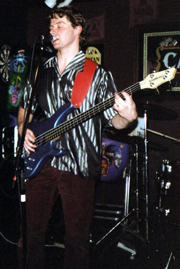 On bass Eric became more interested into the groove and locking in with the Drums. Bob Daisly of Ozzy Osbourne, Geddy Lee of Rush, and the Various Bass players of Boston. Kim Deal of the Pixies. Ozzy Osbourne and Black Sabbath. Sting, and the great, late Jeff Buckley.